Suiboku means “water and ink” in traditional Japanese kanji and is literally the blueprint for the visual communication of this hotel. 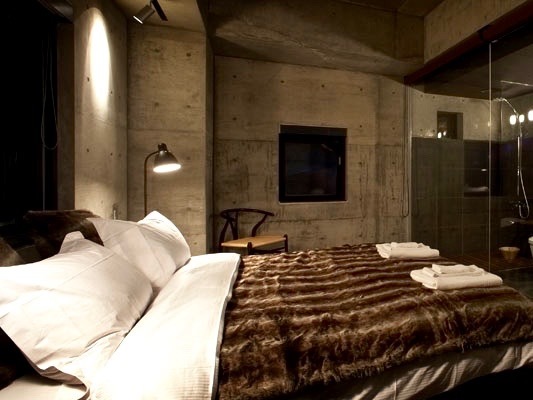 An interplay of bold textures, shaded-light and a charcoal-stained palette provides the backdrop for a unique hospitality experience in Niseko. 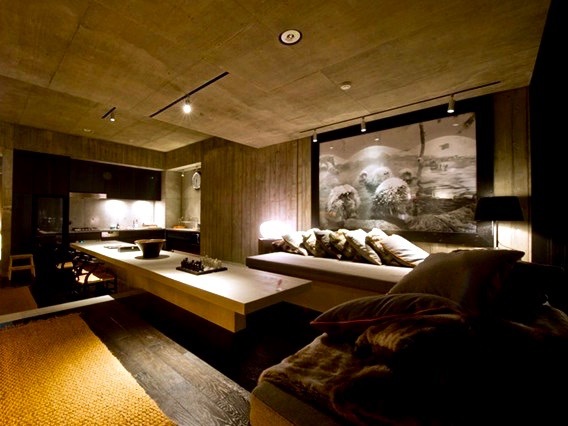 Opened for the first time during the 2010 ski season, Suiboku (水墨) challenges the conventional model for luxury ski resort lodging. Designed with an industrial look -A dark cast-iron entrance lies hidden between concrete beams and steel planks – its cold exterior is warmed with luxuriously appointed furnishings, richly textured materials and exclusive appliances, the Suiboku Niseko Lofts are worth a look a for the discerning traveler in search of a refined residence located near ski hills in Hirafu. Only 10 loft units are available making them especially sought-after in the peak ski season between December and February. These lofts are ideal for families or group of friends who want a refined apartment that allows them to plan meals or entertain guests independently while being located in a very central location. 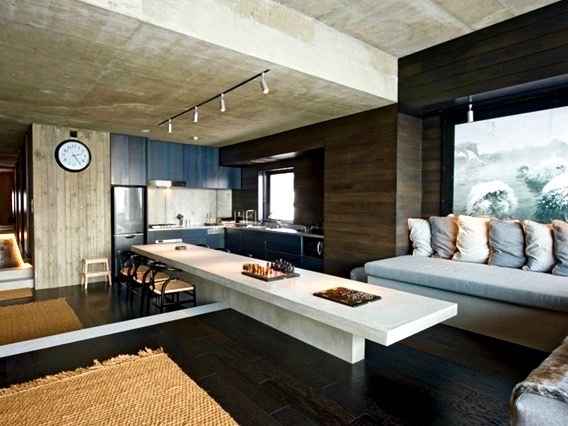 Loft interiors are described by Suiboku as a combination of industrial aesthetics (concrete walls) and traditional Japanese design. 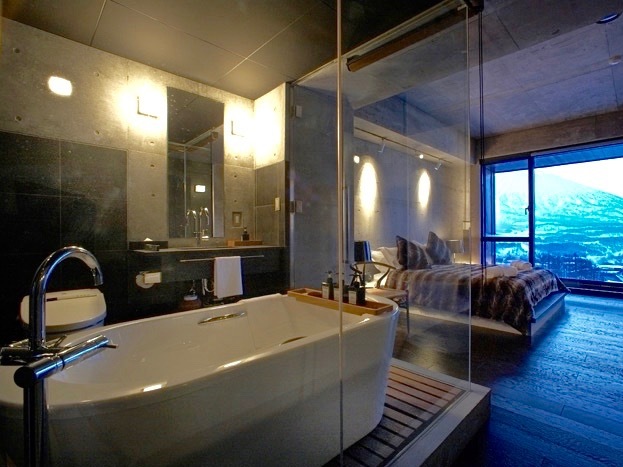 Granite stone baths combine with oversize rain-head showers to create a magazine-like fantasy bathroom. Mushiro (straw) mat rugs sit upon natural wood flooring procured from Nara – the central hub of ancient carpentry in Japan. 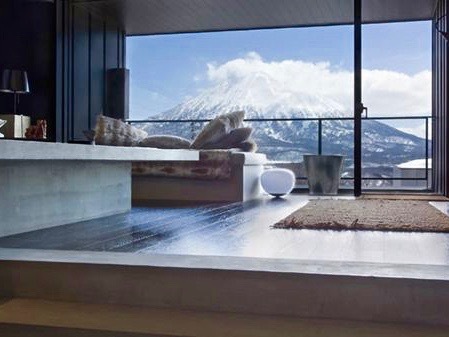 Each level of the Suiboku Niseko offers great views through their oversize windows, particularly the 5th and 6th floors of the building with magnificent full Mount Yotei views on a clear day. 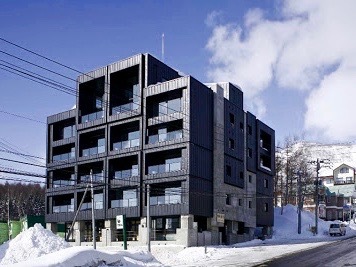 Suiboku is one of only a handful of luxury rental units located in close proximity to all of the action in Hirafu whether it be skiing, dining, shopping or relaxing. 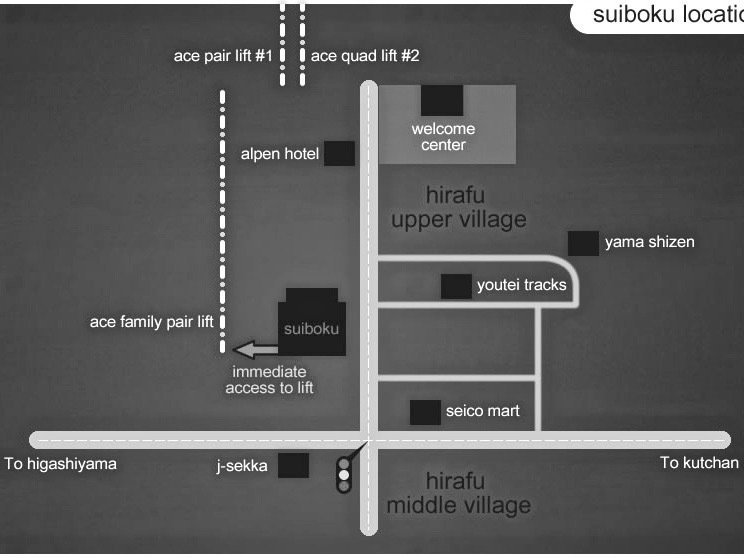 The convenience of having most of Niseko’s services, restaurants and stores within a few minutes walk makes Suiboku Niseko a top contender for travelers wanting a centrally located luxury accommodation that is largely hassle-free. 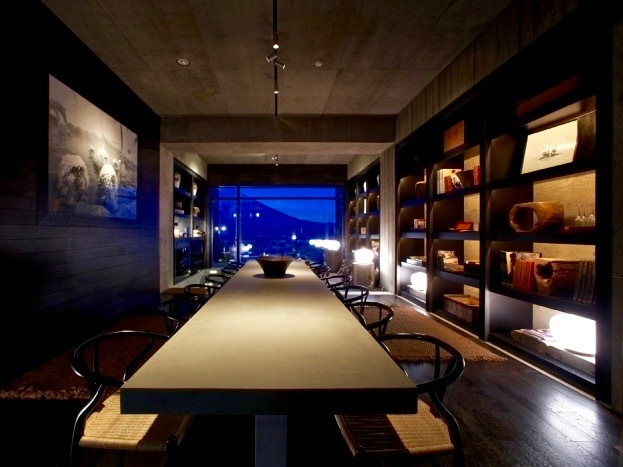 Any issues above the norm are effortlessly handled by Suiboku’s well-trained and highly knowledgeable concierge service team – especially important for the first-time visitor to Niseko. Check-in and check-out shuttles to the welcome center as well as transportation to local destinations throughout guests stay are provided. The reception/concierge service is available daily from 8 am to 8 pm. Pre-provisioning grocery ordering from J- Sekka Deli and Café is also available upon request. Housekeeping is not provided on a daily basis unless specially requested. Two minor cleans and one major clean are included and take place over the course of each week. 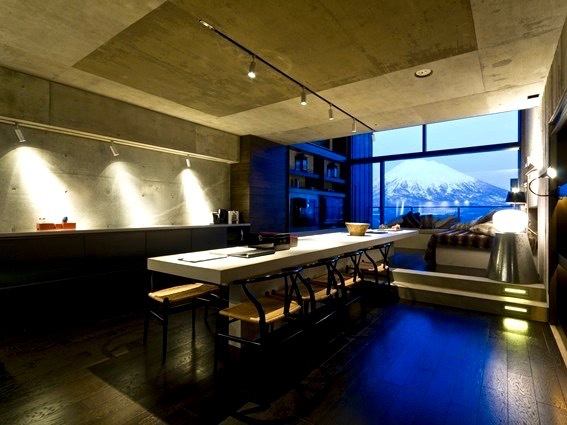 Suiboku Niseko offers 4 different sized luxury lofts with a further variety of layouts within each size category. Each unit can be booked directly from the Suiboku website via a handy calendar. Once the dates and units have been selected the Suiboku concierge replies by email with a price. 1,464 sq. feet/136 sq. metres Balcony/Terrace 21 sq. metres These lofts magnificent full Yotei views from the third floor and has 2 western-style bedrooms with bathroom/spa. 1,506 sq. feet/140 sq. metres Balcony/Terrace 10 sq. metres These lofts are located on the second floor of the building with magnificent full Yotei views and has 3 bedrooms. 1,668 sq. feet/155 sq. metres Balcony/Terrace 49 sq. metres / Summer Roof Terrace 39 sq. metres The Penthouse is located on the 5th & 6th floors of the building and has 3 bedrooms. 3,013 sq. feet/280 sq. metres Balcony/Terrace 41 sq. metres These units are located on the 4th and 5th floors of the building with full Yotei views and has five bedrooms. The loft kitchens are fitted with absolute top-of-the-line appliances to please even the most sophisticated travellers. A typical kitchen includes a Gaggenau oven, Miele dishwasher, Rinnai gas cooker, Toshiba refrigerator, microwave oven and Nespresso coffee maker (not the best choice here but coffee connoiseurs can always step out to nearby MOUNTAIN KIOSK COFFEE STAND to get their fix). Music needs are likewise adequately covered as each loft has two DVD players, a CD player and two iPod player/radios. Warming up after a day on the slopes couldn’t be easier, within each loft a large format Rinnai gas fireplace glows warmly throughout the living space. Bedrooms have large king-sized platform beds – with the exception of the Japanese bedrooms which have tatami mats on the floor and traditional futons for sleeping. Bedrooms are equipped with either king-size or two single bed configuration. Luxurious Frette sheets, pillow cases and towels are paired with faux fur pillows and throws to ensure maximum comfort and warmth whichever the season. Interestingly, lofts come with a selection of books & magazines and a full complement of games, including jenga, mahjong, scrabble, monopoly, western chess and Chinese chess. A lending library of contemporary and classical CDs are available at the concierge desk for use within the lofts during a holiday stay. Clearly these add-on details are meant to provide guests all the comforts of home while away on holiday.